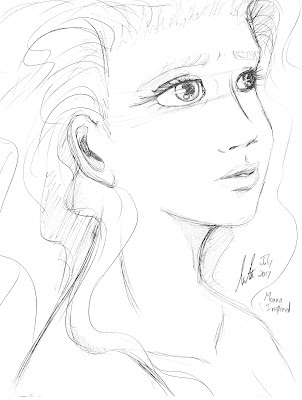 I wonder how many of my sketches are called something like 'wavy hair portrait'. It's just a fun kind of hair to draw. I goofed up on the eyes, though, the one eye looks too far to the right side. Would that be the opposite of cross-eyed? Anyway, I'm excited cuz I started editing my images in Krita now instead of a basic uploader for the interwebs. The images look way better now.